The Asia-Pacific Scout Region (in Japanese アジア・太平洋地域, in Chinese 亞太區) is the divisional office of the World Scout Bureau of the World Organization of the Scout Movement, headquartered in Makati City, Philippines, with satellite offices in Australia and Japan. The Asia-Pacific Region services Scouting in the land area of Asia south of Siberia and east of Central Asia, and the bulk of the Pacific Basin, with the exception of the Federated States of Micronesia, the Marshall Islands and Palau, which are under the Interamerican Region by way of the Aloha Council of the Boy Scouts of America. 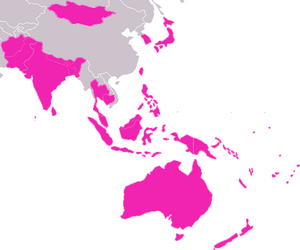 The Asia-Pacific Scout Region has witnessed the births and rebirths of national Scout organizations ever since the region was founded in 1956. Starting with ten founding members, it grew to 25 member countries by 2003, out of which 23 are full-fledged members and two are associate members, encompassing 17 million Scouts. Eight of the 15 largest Scout associations in the world are in the Region. All the formerly communist states of Central Asia and the Soviet Union have developed or are developing Scouting in the wake of the renaissance in the region. For several years, communism repressed Scouting in Afghanistan, where it has newly returned, as well as in Mongolia, which had been the first Soviet satellite state since 1924. Widely separated by uneven resources, cultures, ethnic groups and technological resources, Scouting in the Asia-Pacific Region generally enjoys the respect of the public and by governments, a wide array of volunteers encompassing public and private sectors, and is powered by a small but committed group of professionals in the Scouting service. The current Regional Director of the WSB/APR is Mr. Abdullah Rasheed from the Republic of Maldives. This region is the counterpart of the Asia Pacific Region of the World Association of Girl Guides and Girl Scouts (WAGGGS). Associate Members of the Asia-Pacific Scout Region include The Scout Association of Macau and the Conseil du Scoutisme polynésien. The Asia-Pacific Region contains four of the six countries with no Scouting organization, each of which are due to political constraints within the countries. The Asia-Pacific Silver Jubilee Celebration was held at the regional gathering at the 27th World Conference in Denmark. APRinbox is the monthly e-newsletter of World Scout Bureau/Asia Pacific Region circulated to Scouts and adult leaders in the global community of the Scout Movement, edited by the Asia Pacific Regional Office in Manila, Philippines. For older Scouts (traditionally called Rovers or Rover Scouts), the Region has sponsored region-wide Rover Moots. Fifty-seven participants from 17 countries attended the Asia-Pacific Region Youth Forum in Brunei Darussalam in December 2004. Six Youth advisors were elected and will attend the Regional Committee meetings. The Youth Advisers are Edward Cook, Chairman (New Zealand), Eko Andrianto (Indonesia), Netsai Khaimarn (Thailand), In Sun Ryu (Korea), Maiya Twayanabasu (Nepal), and Aaron Wardle (Australia). They will advise on helping to organize and manage the next youth forum in Japan in 2007. This page was last edited on 17 January 2010, at 20:09.